Introduction: Intraoral local anesthesia is essential for delivering dental care. Needless devices have been developed to provide anesthesia without injections. Little controlled research is available on its use in dental restorative procedures in adult patients. The aims of this study were to compare adult patients acceptability and preference for needleless jet injection with classical local infiltration as well as to evaluate the efficacy of the needleless anesthesia. Materials and Methods: Twenty non fearful adults with no previous experience of dental anesthesia were studied using split-mouth design. The first procedure was performed with classical needle infiltration anesthesia. The same amount of anesthetic solution was administered using MADA jet needleless device in a second session one week later, during which a second dental restorative procedure was performed. 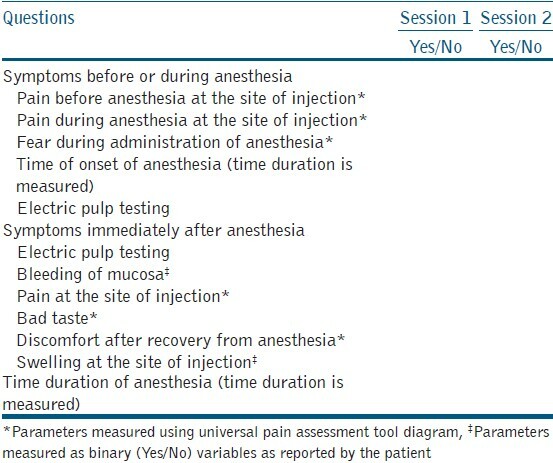 Patients acceptance was assessed using Universal pain assessment tool while effectiveness was recorded using soft tissue anesthesia and pulpal anesthesia. Patients reported their preference for the anesthetic method at the third visit. The data was evaluated using chi square test and student's t-test. Results: Pressure anesthesia was more accepted and preferred by 70% of the patients than traditional needle anesthesia (20%). Both needle and pressure anesthesia was equally effective for carrying out the dental procedures. Conclusion: Patients experienced significantly less pain and fear (p<0.01) during anesthetic procedure with pressure anesthesia. However, for more invasive procedures needle anesthesia will be more effective. The objective of the needless jet injection is to deliver local anesthesia without subjecting the patient to the unpleasant experience of facing the "needle" and to achieve adequate anesthesia that should be acceptable to the patients. Further before it is likely to replace traditional needle injection, it should also be preferred by the patients. The secondary aim is to evaluate the efficacy of the needleless anesthesia for dental restorative procedures. The permission for the study was taken from Institutional Ethics Committee. Informed written consent for carrying out the treatment and their willful participation in the study was taken from the patients prior to starting of treatment. Are you fearful about the procedure of treatment to be performed, not the treatment outcome? Have you ever had significant anxiety before any medical treatment? (intramuscular injection/intravenous injections/routine check-up done by auscultation/ear, nose and throat). Class II/Class III restorations-Multiple surface restorations. Anxious, alcoholic patients, patients giving history of personality disorders, patients who abuse drugs, patients who did not demonstrate subjective signs of anesthesia or required a secondary injection or sedative measures to deliver dental treatment were excluded from the study. Prior to the scheduled dental procedure each patient was tested for local anesthesia sensitivity test. Universal pain assessment tool is a 10 mm scale, 0 represents no pain, pressure or discomfort whereas 10 marked the highest score. This scale along with the following questionnaire [Table 1] was handed over to each patient before commencing the treatment. They were guided to record their subjective response to injection before, during and after the treatment. In the first appointment, dental procedure was performed with classical needle infiltration anesthesia. All parts and preparation of injection but not needle was shown to the patient. Before commencing anesthetic procedure Electric pulp test (EPT) for the test tooth was carried out and the response was noted. Topical anesthetic gel (benzocaine 20%, Beutlich Pharmaceuticals LP, Waukegan, III for 2 min) was applied followed by delivery of anesthesia (Lidocaine 2% with epinephrine 1:80,000 Lignospan special, Steptodont, Saint-Maur-des-Fosses Cedex, France) using standard dental aspirating type syringe (Steptodont) and 25 mm gauge needle (Septoject, Septodont) as described by Malamed. A 0.3 ml of anesthetic solution was discharged buccally to the apex and 0.1 ml lingually or palatally to the subjected tooth. The onset and duration of action of anesthesia was recorded using stop watch, each minute post-injection to determine the soft-tissue pain reaction at the buccal aspect of the tooth using tissue forceps  and pulp reaction of test tooth using pulp tester (Parkell, Model PT-20, Parkell Electronics Division, Farmingdale, New York, USA). In addition, other parameters were noted by the operator as mentioned in the questionnaire/proforma [Table 1] and restorative procedure was carried out. The patient was observed in the operatory until all the symptoms of soft-tissue anesthesia wore off. The total duration of anesthesia was measured from the time of onset till patient reported normal reaction at the soft-tissue. The second injection will noticeably decrease the pain caused by the volume of anesthetic injected in the tissue with a needle and syringe. Type of the tooth-Incisor/canine/1 st molar/2 nd molar. The effectiveness of depth of anesthesia of these two different anesthetic technique was analyzed using this data. The patients were called after 10 days for review. During this visit, they were asked to give preference for the anesthetic technique for future dental treatment 1 st /2 nd /both/none. This question was designed to measure the patient's preference for method of anesthesia delivery. Continuous variables were summarized as mean and standard deviation (SD) and categorical variables were summarized as frequencies and percentages. Difference between proportions in the two techniques was tested by Chi-square test. Student's t-test was used for testing the difference between the means in the two techniques. Data was analyzed using statistical software STATA, Version 10.1, 2009 (STATA Corp, Texas 77845, USA). Mean (±SD) age of the patients was 24.6 (±10.03) years with a range of 16-60 years. There were 9 male (45%) and 11 females (55%) participated in this study. 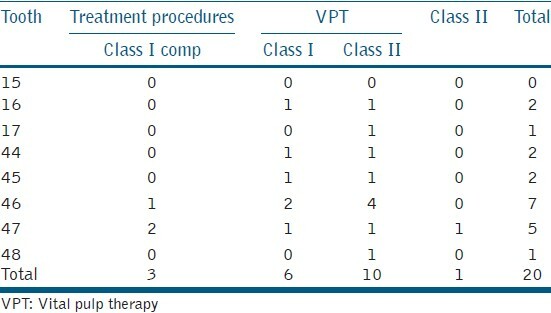 The restorative procedures carried out in this study were 16 vital pulp therapies and 4 restorations (3-Cl I compound; 1-Cl II) on premolar and molar teeth [Table 2]. The acceptance of the pressure anesthesia (MADA jet) for patients requiring restorative procedures in comparison with the classical needle infiltration anesthesia is presented in [Table 3]. In general, most of the patients reported positive experiences for the pressure anesthesia (P < 0.001 except for discomfort,). 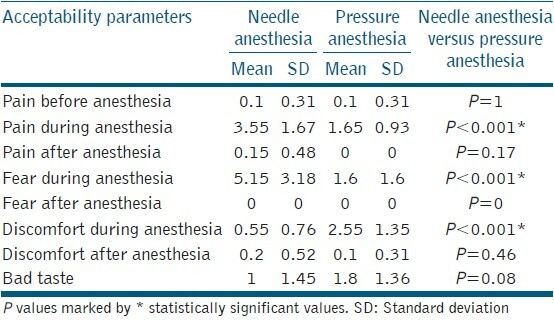 Patients experienced significantly more discomfort (P < 0.001) during injections for pressure anesthesia as compared to classical infiltration; whereas after anesthetic procedure the discomfort was statistically non-significant (P = 0.46). Patients experienced significantly less pain and fear (P < 0.01) during anesthetic procedure with pressure anesthesia. However, operator noted significantly more bleeding from mucosa (P = 0.007) at the injection site with pressure anesthesia. Patients reported no significant difference (P = 0.08) for both the techniques regarding bad taste. None of the patients reported post-operative swelling at the site of injection. At the third appointment, out of 20 patients, 14 patients (70%) stated that they preferred the pressure anesthesia (MADA jet) over classical needle infiltration whereas two patients (10%) gave preference for both the techniques. The time of onset of action for pressure anesthesia was less when compared to classical needle infiltration (P < 0.001) [Table 4]. However, the total duration of anesthesia was significantly more (P < 0.001) with classical needle infiltration (mean 50 ± 9.32 min) when compared to pressure anesthesia (20.75 ± 3.53 min). None of the procedures required additional anesthesia. The readings for EPT showed that pulpal anesthesia with classical needle infiltration was significantly more (P < 0.001) profound than with pressure anesthesia. Pain control during dental operative procedures is very challenging task for the clinician. Pain control using local anesthetics is widely accepted and use of "needle" for administration is considered to be a gold standard; even though, most of the patients are having fearful attitude toward it. To develop a more positive attitude of the patient toward dental procedure adequate anesthesia is essential. Painless and needless anesthesia administration will further enhance patient's co-operation and alleviate his fear. Hence this study was conducted to compare patients' acceptance and preference to needleless pressure anesthesia with classical local needle infiltration and to evaluate the efficacy of the needleless anesthesia for dental restorative procedures. Various anesthetic solutions such as lidocaine, articaine, mepivacaine with different concentration ranging from 2% to 5% have been used in previous studies. , The type amount and concentration of anesthetic solution along with the amount of vasoconstrictor affect the anesthetic result. Bennett et al. in their radiographic and histologic study supported pressure anesthesia as it provides penetration and infiltration roughly comparable to that produced by needle injection to near 1 cm depth, with the use of quantities up to 0.2 ml/injection; as it is the concentration gradient of anesthetic solution diffusing into the surrounding tissue determines how much anesthetic reaches a nerve. Dabarakis et al. in their study found that 3% mepivacaine used with pressure anesthesia did not produced pulpal anesthesia. Hence, in our study, 2% lignocaine with epinephrine 1:80,000 was used with both the anesthetic techniques for completion of dental restorative procedures. According to literature provided by manufacturer very little anesthetic solution is needed to form a wheal which effectively gives adequate anesthesia to carry out restorative procedures. Hence, 0.3 ml of anesthetic solution was deposited buccally and 0.1 ml lingually and no supplementary anesthesia was required. In the first visit, classical needle anesthesia was administered as it is a gold standard as inadequate anesthesia leads to the development of dental fear. , Thus for ethical reasons to avoid the development of dental fear the administration of highly efficacious needle anesthesia was delivered during the first visit and pressure anesthesia in the second visit. Patient's acceptance was assessed using Universal pain assessment tool and the effectiveness of anesthesia was done using soft-tissue anesthesia and EPT. Universal pain assessment tool comprises of Verbal descriptor scale, Wong-Baker Facial grimace scale and activity tolerance test. It was found to be more sensitive as compared to Visual analog scale ,, and hence it was used in this study. Due to rigorous standardization protocols it was difficult to get a large number of patients in stipulated time period; However, post-hoc analysis revealed that this study had sufficient power (>99%) to detect a significant difference in acceptability parameters (e.g., pain, fear, discomfort, bad taste) in the two anesthetic techniques. Two anesthetic techniques were performed at two different visits; hence acclimatization to the anesthetic procedure may have caused reduced fear/pain/discomfort during the second visit. In this study, though neither the post-operative complications were reported by the patients immediately nor confirmed objectively by the operator. Thus to quantify this factor further studies requiring immediate post-operative examinations with sufficiently large number of patients are required. From the literature review of pressure anesthesia; it is noted that no instances of infections were reported even in immunosuppressive patients. Hence, in today's clinical scenario of rigid infection control, this pressure anesthesia device can play a vital role; however controlled microbiological studies may yield better information. This technique may be particularly beneficial in reducing fear from needle view and contribute to limited dose administration which is proved to be beneficial for patients suffering from systemic disorders. Patients experienced significantly less pain and fear (P < 0.01) during anesthetic procedure with pressure anesthesia. In our study sample, majority (70%) of patients preferred pressure anesthesia, only few (20%) patients preferred needle anesthesia and 10% patients preferred both the techniques. In terms of efficacy, pressure anesthesia was successful in all the restorative procedures and vital pulp therapies, provided procedure was completed in 20-25 min. Though pressure anesthesia cannot replace completely the classical needle anesthesia it can be recommended as an alternative and choice of anesthesia in clinical procedures of shorter duration. 1. Corah NL, O'Shea RM, Ayer WA. Dentists' management of patients' fear and anxiety. J Am Dent Assoc 1985;110:734-6. 2. Munshi AK, Hegde A, Bashir N. Clinical evaluation of the efficacy of anesthesia and patient preference using the needle-less jet syringe in pediatric dental practice. J Clin Pediatr Dent 2001;25:131-6. 3. Milgrom P. Increasing dental patients' access to measures for anxiety, fear, and phobia management. Perspectives from a dental school-based fear clinic. Anesth Prog 1986;33:62-4. 4. Milgrom P, Coldwell SE, Getz T, Weinstein P, Ramsay DS. Four dimensions of fear of dental injections. J Am Dent Assoc 1997;128:756-66. 5. Milgrom P, Fiset L, Melnick S, Weinstein P. The prevalence and practice management consequences of dental fear in a major US city. J Am Dent Assoc 1988;116:641-7. 6. Gatchel RJ, Ingersoll BD, Bowman L, Robertson MC, Walker C. The prevalence of dental fear and avoidance: A recent survey study. J Am Dent Assoc 1983;107:609-10. 7. Dabarakis NN, Alexander V, Tsirlis AT, Parissis NA, Nikolaos M. Needle-less local anesthesia: Clinical evaluation of the effectiveness of the jet anesthesia injex in local anesthesia in dentistry. Quintessence Int 2007;38:E572-6. 8. Bennett CR, Mundell RD, Monheim LM. Studies on tissue penetration characteristics produced by jet injection. J Am Dent Assoc 1971;83:625-9. 9. Saravia ME, Bush JP. The needleless syringe: Efficacy of anesthesia and patient preference in child dental patients. J Clin Pediatr Dent 1991;15:109-12. 10. Margetis PM, Quarantillo EP, Lindberg RB. Jet injection local anesthesia in dentistry: A report of 66 cases. U S Armed Forces Med J 1958;9:625-34. 11. Bennett CR, Monheim LM. Production of local anesthesia by jet injection. A clinical study. Oral Surg Oral Med Oral Pathol 1971;32:526-30. 12. Greenfield W, Karpinski JF. Needleless jet injection in comprehensive pain control and applications to oral surgery. Anesth Prog 1972;19:94-7. 13. Needle free injectors MADA jet XL. Available from: http//kabdental.com/small-dental-equipment/Needle-Free-injectors/madajet.htm. [Last accessed on 2011 Nov 26]. 14. Arapostathis KN, Dabarakis NN, Coolidge T, Tsirlis A, Kotsanos N. Comparison of acceptance, preference, and efficacy between jet injection INJEX and local infiltration anesthesia in 6 to 11 year old dental patients. Anesth Prog 2010;57:3-12. 15. Kaufman E, Epstein JB, Naveh E, Gorsky M, Gross A, Cohen G. A survey of pain, pressure, and discomfort induced by commonly used oral local anesthesia injections. Anesth Prog 2005;52:122-7. 16. Universal pain assessment tool. Available from: http//www.stortmontvail.orgservices/painassesmenttool.pdf. [Last accessed on 2011 Aug 7]. 17. Malamed SF. Basic injection technique. Handbook of Local Anesthesia. 5 th ed. St. Louis, MO: CV Mosby; 2004. p. 159-69. 18. Hujoel PP, DeRouen TA. Validity issues in split-mouth trials. J Clin Periodontol 1992;19:625-7. 19. Antczak-Bouckoms AA, Tulloch JF, Berkey CS. Split-mouth and cross-over designs in dental research. J Clin Periodontol 1990;17:446-53. 20. Novaes TF, Matos R, Raggio DP, Braga MM, Mendes FM. Children's discomfort in assessments using different methods for approximal caries detection. Braz Oral Res 2012;26:93-9. 21. Wong DL, Baker CM. Pain in children: Comparison of assessment scales. Pediatr Nurs 1988;14:9-17. 22. Rajasagaram U, Taylor DM, Braitberg G, Pearsell JP, Capp BA. Paediatric pain assessment: Differences between triage nurse, child and parent. J Paediatr Child Health 2009;45:199-203. 23. Ogle OE, Mahjoubi G. Advances in local anesthesia in dentistry. Dent Clin North Am 2011;55:481-99. 24. Jena A, Shashirekha G. Effect of preoperative medications on the efficacy of inferior alveolar nerve block in patients with irreversible pulpitis: A placebo-controlled clinical study. J Conserv Dent 2013;16:171-4. 25. Ramachandran A, Khan SI, Mohanavelu D, Senthil Kumar K. The efficacy of pre-operative oral medication of paracetamol, ibuprofen, and aceclofenac on the success of maxillary infiltration anesthesia in patients with irreversible pulpitis: A double-blind, randomized controlled clinical trial. J Conserv Dent 2012;15:310-4. 26. Verma PK, Srivastava R, Ramesh KM. Anesthetic efficacy of X-tip intraosseous injection using 2% lidocaine with 1:80,000 epinephrine in patients with irreversible pulpitis after inferior alveolar nerve block: A clinical study. J Conserv Dent 2013;16:162-6.